The 1" (2.5cm) wide webbing of the Norco™ Bed Pullup helps clients use upper body strength to sit up in bed. Four pullup loops are spaced 10" (25cm) apart. 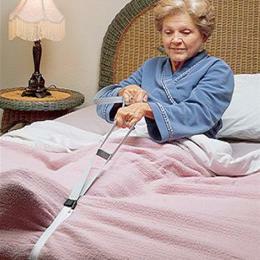 The 40" (102cm) long white loop attaches around a leg or bed frame. A hook and loop strap holds the bed attachment buckle securely. Weighs 4 oz. (113g). Machine washable.